With today’s typical diet being low in nutrients and high in empty calories coupled with high levels of stress and added medication, it’s no wonder that more and more people are suffering from some kind of bloating. In addition to feeling discomfort bloating can come with every embracing symptoms such as gas or needing to go to the bathroom very quickly. So what are the most common symptoms of a bloated stomach? If your stomach protrudes outwards and you constantly feel uncomfortable because you have built up gas inside of you then this is a sign of bloating. In fact many sufferers from bloating even joke around saying how pregnant they feel because of the need to unbutton their pants when their bloating becomes severe. The great news is a bloated stomach is very different from actually gaining fat mass around your stomach since the bloating is temporary with air simply being stuck around your abdomen causing the tummy to distend outwards. Even better, stomach bloating can be rectified very quickly by simple changes to your diet and lifestyle that can be implemented right away! Check out how quickly Crystal W. was able to feel more energetic and alleviate the bloating she was suffering from for years by following my 5 Day Reset Program. Generally speaking bloating is usually a problem with digestion where excessive gas in the intestine accumulates due to inadequate protein digestion (causing foods to ferment), the inability to brake down carbohydrates and sugars fully, and also imbalances in gut bacteria. In our digestive tract, there are countless of healthy and unhealthy bacteria competing for dominance and when the “bad bacteria” outweigh the good, an imbalance can lead to uncomfortable bloating and excessive gas that you might be suffering from. As a Nutritionist, I cannot emphasize how much diet plays a role with bloating and cleansing our bodies which is why I always recommend 25-30 grams of fibre including 3-4 oz of water daily which is easy to achieve with a diet composed of primarily single ingredient foods, fruits, vegetables, nuts/seeds, and grains. 2. Dairy Products (Refined): including flavoured yogurts with sugar and artificial ingredients especially because manufacturing processes remove important enzymes for good gut health. 3. Carbonated Drinks: sodas include massive amounts of sugar or artificial sweeteners too. 5. Refined Grains and Grain Products: Gluten can be difficult to digest for many people. Oats and grain consumption should be monitored. 6. Caffeine: for some people, coffee can promote bloating especially when digestion is already compromised. So what can we do to change up our diet and start adding good foods to help alleviate uncomfortable bloating symptoms? 1. Probiotics: Better known as “good bacteria” that acts like friendly fighters in your digestive tract battling bad bacteria that can trigger digestive issues and bloating reactions. I highly recommend Probiotic supplements and also foods like sauerkraut, kimchi, yogurt, kefir, and kombucha. 2. Fruits and Vegetables: Water-rich fruits and vegetables provide electrolytes and important enzymes when it comes to relieving your body of stomach bloating naturally. I also recommend more raw and cooked leafy greens, cucumbers, celery, fennel, artichoke, berries of all kinds, melon, and steamed vegetables. 3. Raw Dairy: Pasteurized/Homogenized Raw dairy can be very beneficial to your digestion and even superior than the conventional kind of dairy sold in supermarkets because typical manufacturing processes kill enzymes that are important for digestion. 4. Herbs, spices, and teas: Ginger, Dandelion, Aloe Vera, and Fennel are very soothing to the digestive tract with many of these herbs acting like natural diuretics to help release the body of excess fluids and even relax the digestive tract relieving constipation. When coffee becomes a culprit, I also suggest trying Green Tea which is helps with anti-inflammatory symptoms and also promotes gut health. A simple change in diet (by implementing the foods I suggested and moving away from those culprits) will not only help you get rid of those uncomfortable bloating symptoms but you’ll also feel fantastic. 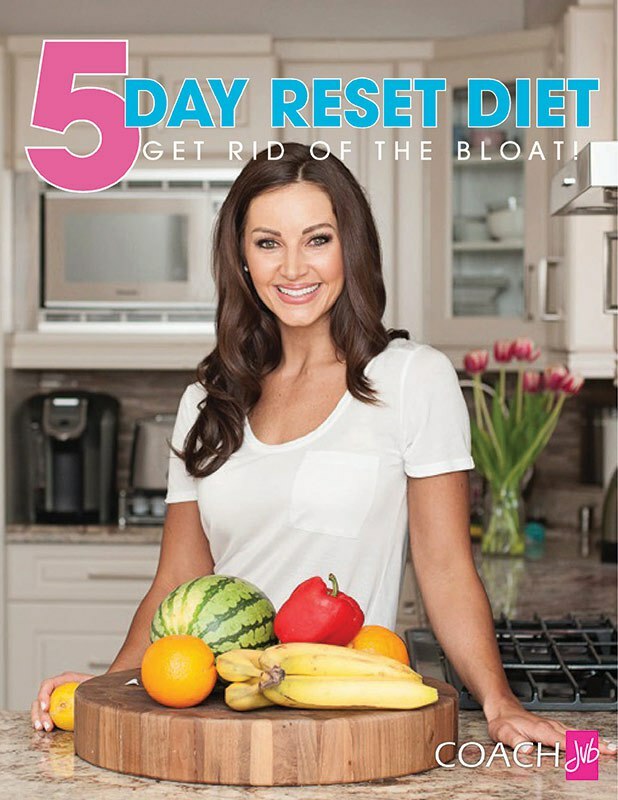 If you haven’t already grabbed my 5 Day Reset Diet Click here and if you already have please let a friend in on the secret and do it together. I should also let you know about my workout challenge that is coming up in September. It’s quick 20 minute home workouts that will also be FREE so Click Here to be added to the waiting list. Next PostNON GMO, Yes or No?